This detached house has a beautiful, unobstructed view, has a lovely terrace, a large sloping garden and a swimming pool. 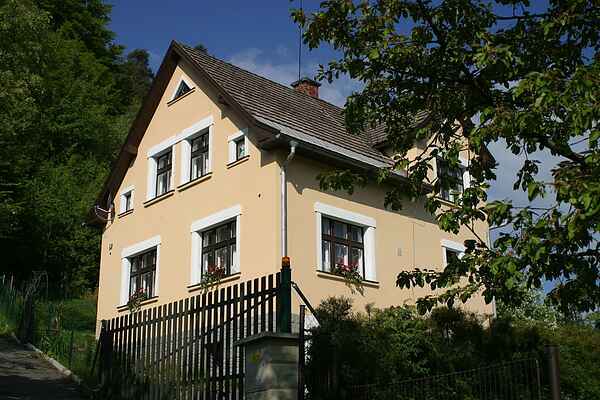 Your house lies 100 m away from the Panteon castle ruins, in the beautiful natural area Bohemian Paradise. Here, you'll live quietly at the forest's edge in the vilage Mala Skala. Your holiday home has a neat interior. From your holiday home there is a staircase leading straight into the woods. This town is centrally located and known for its many castles and ruins in the vicinity. The river Jizera lies only 100 m from your holiday home and is suitable for canoeing. The motorway to Prague (ca. 70 km) and the beautiful city Liberic are about 12 km away. So take a chance and go stroll around beautiful, historical Prague for a day. In Liberic you can find all the possibilities to enjoy delicious Czech food. For a nice hike through nature you can walk straight into the forest. All facilities are within walking distance.